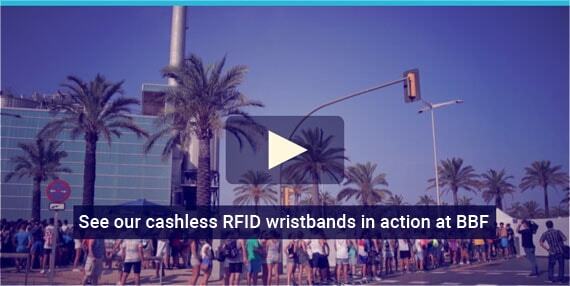 WHY CHOOSE RFID TECHNOLOGY FOR EVENTS? RFID wristband technology is re-shaping the way event organisers control access, manage transactions and engage their audiences. ID&C offers a range of tried and tested RFID products including RFID wristbands, laminates, cards and vehicle passes. Together with our partners, we help provide RFID solutions, designed to enhance live events for organisers and fans. Discover more on RFID security below and how its different applications can generate new revenue streams for your festivals and events. Allowing children to have their own wristbands for purchasing food and drinks, gives them a sense of independence. RFID technology allows parents to set spending limits, or remove the option for payments, leaving it solely as a key for room and locker access. RFID systems also offer ways of increasing child safety. A parents' RFID wristband can be linked to their child's, preventing minors from gaining access to certain areas or leaving a perimeter without their parents. Parents will also find comfort in the fact that if a child is lost, RFID wristbands can be used to determine the last location of the child. Operators will see improvements in their bottom line because RFID technology eradicates the chance of fraudulent entry passes that negatively impact revenues. The opportunity for theft and fraud is reduced when guests only need to wear a wristband. There's no need to carry cash, credit cards or even a wallet. And, just like a credit card, if an RFID wristband is lost or stolen, an RFID system allows easy cancellation and re-issue. RFID wristbands are associated with encrypted, individual IDs, so it’s pretty much impossible to duplicate them. And if you felt like anyone was up to anything they shouldn't be, you can quickly deactivate an individual wristband to cancel entry into certain areas. As well as using the data to find their last known whereabouts. Once you are RFID enabled, you'll have the ability to collect intelligent data and deep analytics on your customers and their behaviour. You'll easily discover how guests use, interact with and move around your attractions, helping you to determine traffic patterns, dwell times for services, and tap into undiscovered operational efficiencies. With RFID cashless wristbands in action, you'll also get smart data on purchases, allowing for optimized merchandising and concessions. Data gathered from RFID system integrations is used to streamline and improve experiences for future guests. ID&C's RFID wristbands and passes are designed to work with any RFID system or solution, from any integrator, anywhere in the world.